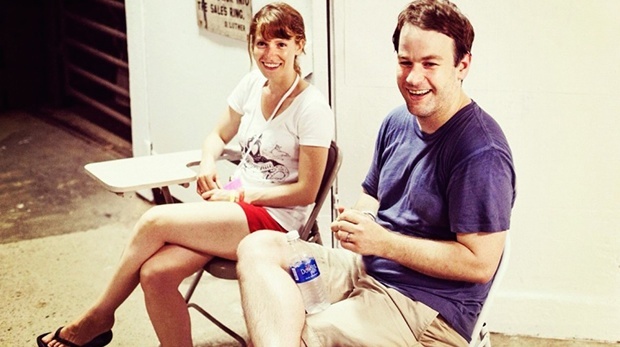 Liliana Greenfield-Sanders and Mike Birbiglia at last year's Wassaic Project Film Festival. Now in its seventh year, the multidisciplinary Wassaic Project’s Summer Festival — whose 2014 edition opens today — offers an intimate screening experience where independent films by emerging filmmakers mix with art, music, dance and the great outdoors. It’s probably the only festival where films are projected in a Cattle Auction Ring, a fact doubly surprising given the festival’s location just two hours from New York on Metro North’s Harlem Line. The Wassaic Project is a non-profit that has as its mission the creation of “genuine and intimate context for art making and strengthening local community by increasing social and cultural capital through inspiration, promotion and creation of contemporary visual and performing art.” Attendance has grown over the six years of the Wassaic Project’s festival from 500 people to 4,000, and this year, a month-long screenwriting residency will offer support outside of the festival’s weekend. The festival is small and focused, with three features — Desiree Akhavan’s Appropriate Behavior; Charles Rogers and Sarah-Violet Bliss’s SXSW-winning Fort Tilden; and Talya Lavie’s Zero Motivation — playing along with shorts curated by Short of the Week and a special midnight surprise movie. Filmmaker Liliana Greenfield-Sanders is Wassaic’s Film Program Director. Below, she talks about the festival, the town of Wassaic, and the challenges of being a curator while being a festival. Filmmaker: Tell me how you got involved with your collaborators and with the festival. Greenfield-Sanders: The co-creators and I — Bowie Zunnino, Eve Biddle and Jeff Barnett-Winsby — grew up in downtown Manhattan, but our paths didn’t cross until we became artists and shared a common interest in building community,. Bowie, Jeff and Eve saw the space up in Wassaic and became so excited about it. They had this infectious spirit and wanted to get other artists up there and offer possibilities to show their work to the local community. It’s only an train ride away — it’s the last stop on the Harlem line in Hudson Valley. And the local residents, some of who go to local schools, or teach art to children, [are involved] too. It’s an amazing mix of people. Filmmaker: How did they discover the town and the specific facilities? Greenfield-Sanders: Bowie’s parents had a house pretty near by when she was growing up. Her dad is historical architect, and they came across these incredible buildings. There’s a seven-story grain elevator that’s been renovated into an art exhibition space showing 70 to 100 artists during the festival. Horse barns have been turned into artists studios. There’s a cattle auction ring that’s been turned into a stadium movie theater. As we grew, we have built outdoor film screens and stages for music. What’s great is that you can walk around in a 20-minute period and take in all of these different disciplines. There are not many festivals where you can do that. Filmmaker: How does your film programming play off the art and music programming? Or does it? Tell me more about the programming. Greenfield-Sanders: I try to take a cue from the art and the music in terms of showing emerging filmmakers. This year, we have a darkly comedic theme going on in the feature film program that I am very excited about. I’m not sure how it’s going to link to the other disciplines exactly. But there are films by three first-time feature directors, and what I love about these films is that they are not constrained by [thinking about] how their box office will do. They take chances. Desiree [Akvavan’s] film is very personal; it’s exactly who she is, and she’ll be our first writing resident up in Wassaic. Zero Motivation — we showed [director] Talya [Lavie’s] short at the festival a few years ago. And this year we have Short of the Week programming shorts. Filmmaker: What’s the experience of the whole weekend? How does it change day by day? Greenfield-Sanders: The different days have very different vibes. Friday night people are just starting to arrive, and it’s more intimate. You can sit by the campfire, go on a hike, go to a swimming hole, and the art is open until pretty late. The bands are always going. Saturday is back to back to back in all the disciplines. Sunday it starts to clear out but there’s still programming going. People camp on the lawn all weekend. [Camping is available for a small fee. — Editor.] And you don’t have to buy a pass or feel intimidated or know someone to go to a party. Filmmaker: How did you select the films? Can people apply, or are you curating them from films you’ve encountered during the year? Greenfield-Sanders: I wish I had the staff for that. You know, I’m a filmmaker myself and I don’t do this all year round. I try to temper [my work here] with what I do as an artist myself and try to bring the best things we can to the festival. We’re not concerned with premiere status, just with what I think our audience would enjoy. Filmmaker: Tell me more about the residency. Greenfield-Sanders: A few years ago, Bowie, Jeff and Eve started an artist residency, and we’ve been talking for a while about how seamless it would be to bring a screenwriter up there too because we have the space and infrastructure. I’ve been through a few labs myself and have been grateful for the support I have received. It’s important to get out of your apartment, out of the grind and just concentrate on the work. Filmmaker: Is is the kind of residency where Desiree will be sequestered up there for a month? Does it have other components? Greenfield-Sanders: We’re not interested in forcing people to be there for the full time. And we will be setting her up with a mentor, the right person for where she is now in her process. Filmmaker: And tell me about balancing filmmaking and curation. How does that work in your life? Greenfield-Sanders: I came into filmmaking, as most people did, because I love films. It seems totally inseparable from my writing to be watching great new films, seeing what people are doing, and becoming inspired by them. There’s definitely more work that goes into [curation], but I love doing this because I get to be out of myself and what I’m doing and to think about the community of independent filmmakers and writers. I feel lucky I get to take the time to do this.